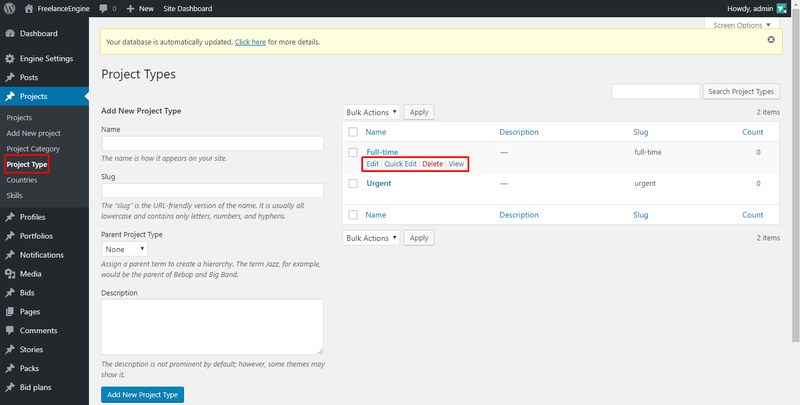 To manage the projects, visit your admin panel and choose Projects tab. Projects: this section tracks all the posted projects which you can easily edit or delete. It also shows you all the pending projects and draft. Add a new project: just like how it’s named, this section is used to add new projects. This is similar to how you make a post. Complete all the needed information hit Save then you can create a new project. Project category: this section allows admins to add and control all the project categories. In the left corner of the page, you’ll find different fields, complete all the needed information, click Add new project category then you’ll have the new one. You can control all the categories in the right corner of the page, edit or delete, it all depends on your choice. Project type: as easy as you control the Project category, this section allows you to create different project type. Complete all the blank sections in the left corner of the page to create a new one then manage it in the right corner of the page. Skills: Similar to this above section, this section helps you to add new skills for users to choose. Similar to the above tab, admins can control all the posted profiles in this one. Profiles: all the profiles are tracked in this section, you can easily edit or delete the unsuitable ones. Add new profile: you can manually add new profiles in this section just like how you add new projects. Countries: this section allows you to add new countries for users to choose their locations. 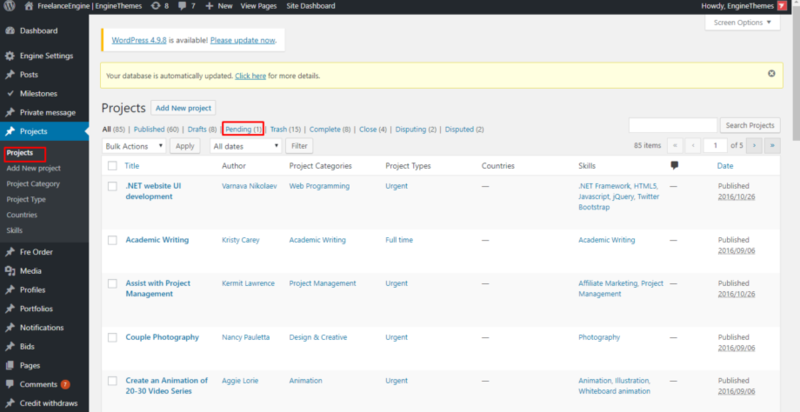 Project category /Skills: these two sections are the same as the two in Projects tab. 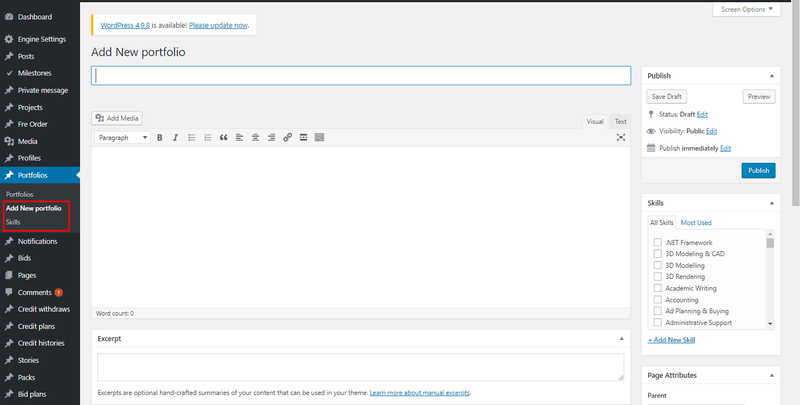 Admins can control all the posted portfolios in this section. You can edit or move these portfolios to trash, it helps to enhance admin management ability. 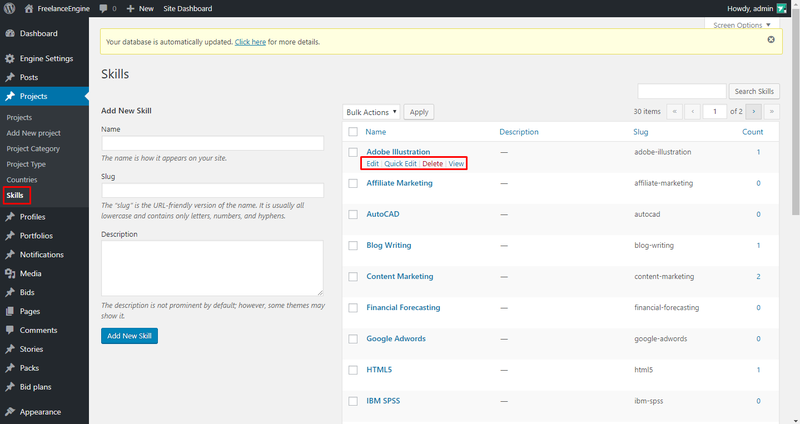 You can edit or delete each portfolio at a time or you can edit different ones at the same time. In addition, you also have the right to add new portfolios, as well as skills for the freelancers. This is the section helps you show off all the good comments on your site. You can also edit or delete the existing ones. This is how it’ll appear in the front – end.